David Frankfurter (éd. 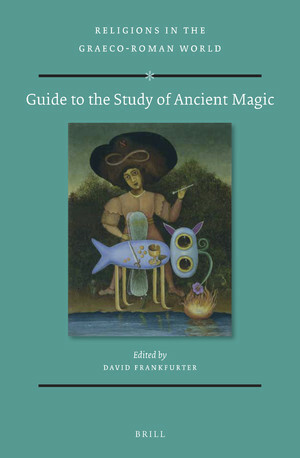 ), Guide to the Study of Ancient Magic, Leyde-Boston, 2019. In the midst of academic debates about the utility of the term “magic” and the cultural meaning of ancient words like mageia or khesheph, this Guide to the Study of Ancient Magic seeks to advance the discussion by separating out three topics essential to the very idea of magic. The three major sections of this volume address (1) indigenous terminologies for ambiguous or illicit ritual in antiquity; (2) the ancient texts, manuals, and artifacts commonly designated “magical” or used to represent ancient magic; and (3) a series of contexts, from the written word to materiality itself, to which the term “magic” might usefully pertain. The individual essays in this volume cover most of Mediterranean and Near Eastern antiquity, with essays by both established and emergent scholars of ancient religions. In a burgeoning field of “magic studies” trying both to preserve and to justify critically the category itself, this volume brings new clarity and provocative insights. This will be an indispensable resource to all interested in magic in the Bible and the Ancient Near East, ancient Greece and Rome, Early Christianity and Judaism, Egypt through the Christian period, and also comparative and critical theory.